Grant Ford-Hodges discusses his research findings on asthmatic horses with PVM Assistant Professor of Veterinary Anatomic Pathology Abigail Durkes. 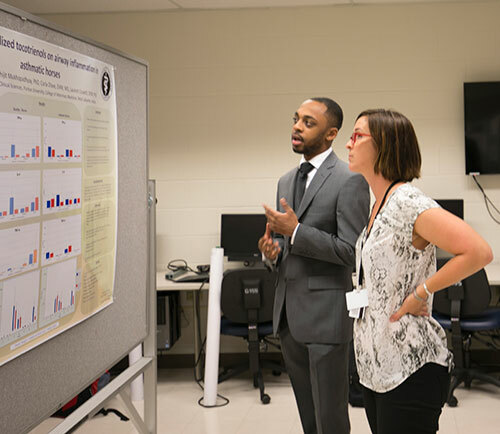 Participants in Purdue Veterinary Medicine's 2017 Summer Research Program shared the findings of their summertime research projects during the annual poster session on Wednesday, August 2 in Lynn G119/155. A total of 19 students participated, including 18 from the Summer Research Program and one undergraduate student from Dr. Laurent Couёtil's lab. The Summer Research Program pairs students with PVM faculty members based on mutual areas of interest for 11 weeks of focused research, seminars, field trips, and symposiums. This year's program was co-sponsored by Boehringer Ingelheim (formally Merial) and hosted 18 veterinary and pre-veterinary students, including 12 Purdue DVM students, two Purdue undergraduate students, and one undergraduate each from Alcorn State University, Howard University, Lawrence University, and Wheaton College. There was a high turnout of faculty and staff who stopped by to view the posters and talk with the student presenters. 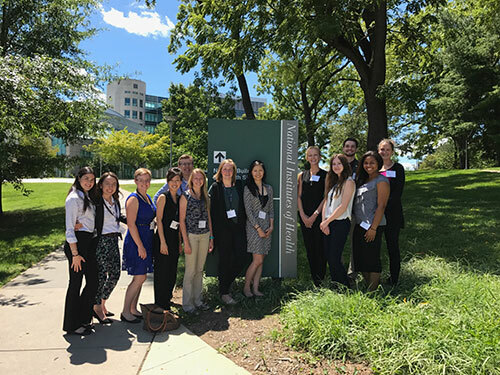 The following day, DVM students in the Summer Research Program traveled to the National Institutes of Health in Bethesda, Maryland for the National Veterinary Scholars Symposium which began on August 3 and ended on August 6. The students enjoyed the opportunity to share their research posters on a grander scale at the national symposium. Over 500 veterinary students from colleges across North America participated. The symposium included a session on professional development that featured Dr. Tiffany Lyle, assistant professor of veterinary anatomic pathology in the Department of Comparative Pathobiology. 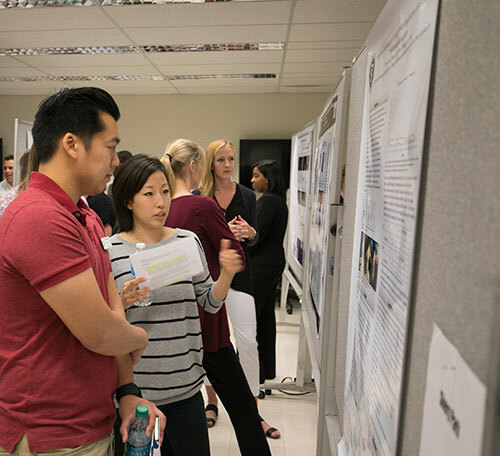 Shery Park, of the DVM Class of 2020, discusses her research findings along with fellow PVM Summer Research Program participants at the annual poster presentation in Lynn Hall. 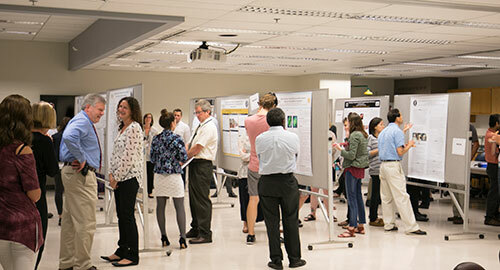 PVM faculty, staff and students crowded into Lynn G119/155 on August 2 for the Summer Research Program participants' poster session. Student scholars traveled to the National Institutes of Health in Bethesda, Md. for the National Veterinary Scholars Symposium August 3 - 6.